One of my favorite things about entrees from a Mexican restaurant are the sides of rice and beans that come along with it. Since I’m a huge fan of Mexican food, I’ve pretty much become addicted to these popular side dishes. However, the restaurant version of Spanish rice isn’t so Weight Watchers friendly. 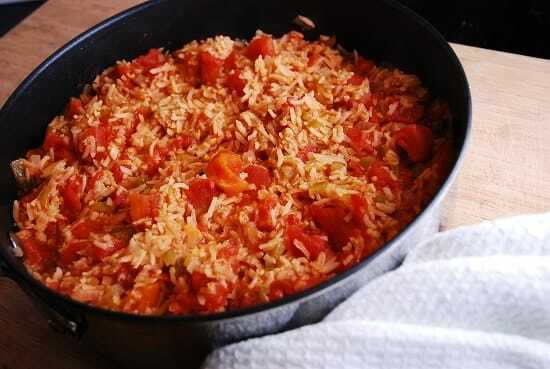 It’s actually a pretty easy dish to makeover, and the end result is a delicious and incredibly flavorful low calorie Spanish Rice that tastes just as good as the kind you’d get in a restaurant, but less greasy and a lot more fresh tasting. And just 4 Points per serving! So instead of indulging at your favorite Mexican restaurant, make this healthy Spanish Rice at home yourself, and save yourself some Points and some $$. Enjoy! The perfect accompaniment to your favorite Mexican food entrée, this low calorie Spanish rice recipe is not only Weight Watchers friendly, it’s delicious, healthy and loaded with fiber and protein. Spray a large, non-stick skillet with non-fat cooking spray and set over medium/high heat. Add in rice and brown for about 3-4 minutes. Add in onion and garlic. Cook onion rice mixture, stirring frequently, for about 4 minutes, or until onions are softened. Add in broth and bring to a simmer. Stir in tomatoes, chiles, salt, pepper, paprika, oregano, and coriander. Bring to a simmer. Lower heat to medium, cover and cook 15-25 minutes, depending on the type of rice and the instructions on the rice package. Remove from heat, fluff with a fork and let stand for 5 minutes before serving. You don’t specify a cup of cooked rice or uncooked rice. That makes a HUGE difference. I was kind of bummed on my first try of this recipe. My brown rice was not instant, and therefore still crunchy/hard. I tried adding water and cooking longer, but still no good. Also, next time I will omit the coriander. I guess I’ve never cooked with it and had no idea how strong it’s flavor is. I’m not giving up, with work with it again – as I LOVE spanish rice! Thanks for the recipe! Brown rice can be tricky…it takes longer to cook than white rice and the texture is more course. It’s taken me a while to learn how to prepare it just right. I’ve had great success with Trader Joe’s 15 Minute Quick Cook Organic Brown Rice. Looks great! Is it supposed to be a 4 oz or 40 oz can of green chilies?